According to a new market research report \“3D Cell Culture Market by Product (Scaffold-free (Hanging Drop, Bioreactor), Microfluidics, Magnetic Levitation), Application (Cancer, Stem Cell Research, Drug Discovery), End User (Pharmaceutical, Biotech, Research) – Global Forecast to 2022\“, published by MarketsandMarkets?, the 3D Cell Culture Market is expected to reach USD 1,720.3 Million by 2022 from USD 682.8 Million in 2017, at a CAGR of 20.3%. The growth of the market is attributed to the rising focus on developing alternative methods for animal testing, funding initiatives from government and private investors, technological advancements and product launches, and growing awareness. The 3D cell culture market is highly competitive with the presence of several small and big players. 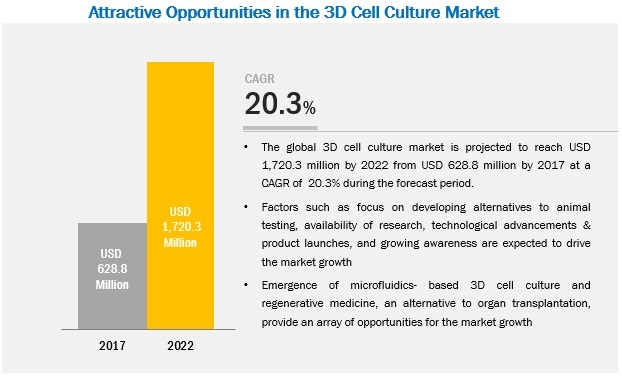 Some of the players in the 3D cell culture market include Thermo Fisher (US), Corning (US), Lonza (Switzerland), Merck (Germany), ReproCELL (Japan), and InSphero (Switzerland). The other players operating in this market include Global Cell Solutions (US), Synthecon (US), 3D Biotek (US), Kuraray (Japan), Hamilton Company (US), Mimetas (Netherlands), Emulate (US), Nano3D Biosciences (US), and QGel (Switzerland). Thermo Fisher was the leading player in the 3D cell culture market in 2016. The companys leading position is primarily attributed to its strong brand image and product portfolio. Thermo Fisher constantly focuses on strengthening its product portfolio. For instance, in 2014, the company introduced Nunclon Sphera, a polymer-coated cell culture surface with low-binding characteristics, which supports the growth of 3D cancer spheroids and embryoid bodies. The company has a strong presence in over 100 countries across the Americas, Asia Pacific, Europe, and the Middle East & Africa. Corning was the second-largest leading player in the global 3D cell culture market in 2016. The leading position of the company is attributed to its robust product portfolio which includes scaffold-based and scaffold-free products. To maintain its strong position in the market, the company focuses on adopting organic and inorganic growth strategies such as expansions, agreements, partnerships, and collaborations. For instance, in November 2015, Corning established its distribution center in Shanghai, China. Corning, Flacon, and Axygen are some of the leading brands available through this center. This enabled company to expand its market presence in the emerging Asian market. Moreover, to sustain its presence, the company focuses on collaborating with prominent players operating in this market. In this regard, in March 2014, Corning agreed with American Type Culture Collection (ATCC) to co-develop and co-market new applications for current ATCC and Corning products. Dont miss out on business opportunities in 3D Cell Culture Market. In 2017, North America is expected to dominate the market followed by Europe. The large share of this geographical segment is attributed to factors such as increasing incidence of cancer, presence of a well-established pharmaceutical and biotechnology industry, significant support from the government in the form of funds and grants, availability of technologically advanced products, and presence of key market players.